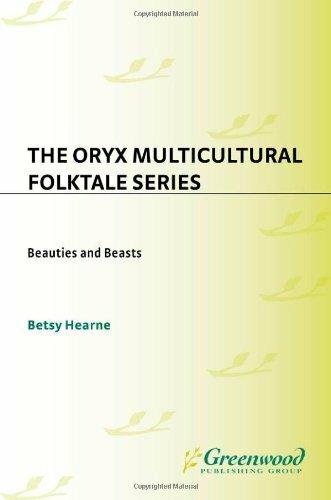 Here are the top 30 fairy tales, folk tales & myths books for 10 year olds. Please click Read Review to read book reviews on Amazon. You can also click Find in Library to check book availability at your local library. If the default library is not correct, please follow Change Local Library to reset it. A vividly depicted, modern-day fairy tale. The heroine’s escapade is textured with real imaginings and experiences of a true-life skinny girl, bringing to life the quest to save dragonkind from extinction. Woven into the narrative is enriching detail, colorfully embossed upon an already prismatic fable. This plot, detail, and richness of description is written so the reader visualizes an animated movie screen performance, as they are drawn into Skinny Girl’s adventures. Vocabulary is not minced. Children deserve to learn and utilize a valuable lexicon outside the classroom. A great nation was assuredly influenced by the results of quality reading during a time when there was no such thing as video games and television to compete. 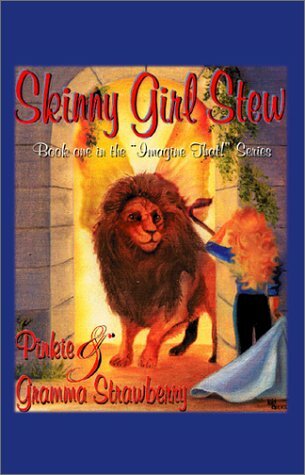 Skinny Girl Stew provides an opportunity to easily comprehend the concept of larger words, based on well-built sentence context. At the start of summer, no one, including thirteen-year-old Ethan Morus, knew that he’d been born with a treasure hunting instinct. Now that summer has ended, all groups desiring power are either seeking Ethan’s services or hoping to end his young life. Although he has pledged his allegiance to the Light, even they are leery of training him for fear the Dark may lure him to their side. Ethan will face beasts and enchantments on this dangerous adventure, from deep below the water’s surface to high in the mountains. 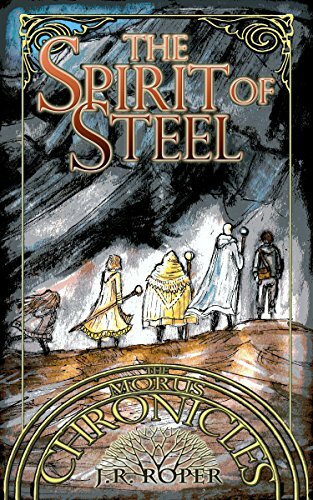 Yet his greatest enemies stand by his side as the line between Light and Dark blurs in the search for the Spirit of Steel. When the girl, Silence, is sent by the trees to save Yesterday, she doesn’t know what her task is, only that it is important. Returning to the village that cast her out, Silence recognizes her purpose: to join the dead with the living in an act that celebrates their memory. In this classic tale from early seventeenth-century Korea, Hong Kil Dong, the son of a powerful minister, is not entitled to a birthright because his mother is a commoner. After studying the martial arts, divination, swordplay, the uses of magic, and the wisdom of the I Ching, the Book of Changes, Hong Kil Dong sets off on a quest for his destiny. He leads a band of men to right the injustices shown to the peasants by some powerful and corrupt merchants, ministers, and monks. Hong Kil Dong can then claim his rightful role and become a wise and just leader. 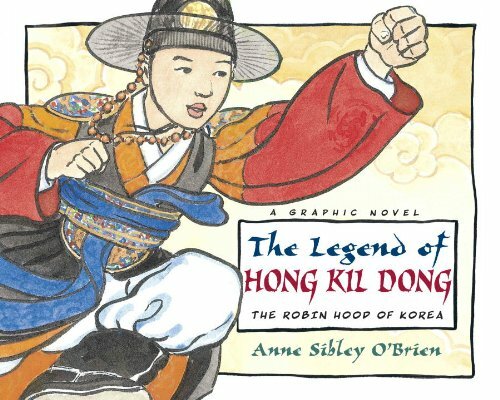 This graphic book captures the drama and pageantry of sixteenth-century Korea during the Chosun dynasty and pays tribute to the adventure story that became the first novel written in the Korean language. Do Native Americans know the location of the cursed “Lost Gold of Devil’s Sink”? Did Sir Francis Drake bury millions of dollars’ worth of ancient Incan treasures? Has anyone found the box of gold coins buried by a reputed giant in the Washington rain forest? Is there a noble family’s fortune buried near an old log cabin in the Cascades? The Pacific Northwest provides a picturesque backdrop for these stories as it stretches from the rugged coastline east over the snowy mountains and into the vast plateau that leads to Idaho. 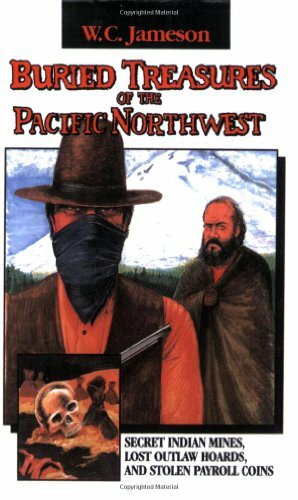 For over a century, outlaws, prospectors, Russians, Indians, loners, soldiers, and immigrants have thrown themselves into all of the adventure and intrigue money can buy. When Peach Blossom Village’s bridge disappears, Master Chen must solve the mystery! 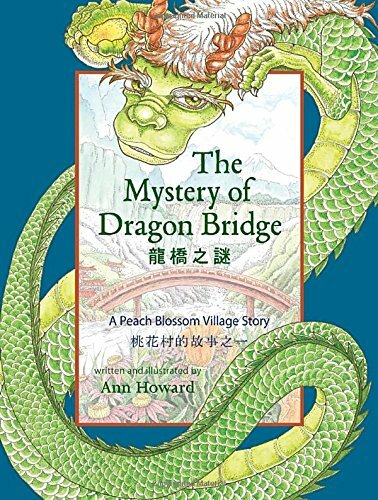 The Mystery of Dragon Bridge is an English-Chinese bilingual children’s fantasy story. The tale revolves around the inhabitants of Peach Blossom Village and the mysterious Dragon Bridge—the villagers’ only connection to the outside world—which suddenly vanishes in the middle of the night. The astonished villagers appoint a retired soldier, Master Chen, to investigate what has happened to their missing bridge. What he finds will surprise readers as much as it did the perplexed villagers! Both a satisfying mystery story and a lesson in working together for the community, preserving the environment, and appreciating what is often taken for granted, The Mystery of Dragon Bridge can be enjoyed by younger children and intermediate readers alike. The short, easy-to-read story is presented in both English and simplified Chinese, with vocabulary suitable for students aged 7 to 10, and features 12 beautiful watercolors painted by the author. California Indians vividly describe various aspects of traditional and contemporary Indian life, in a clear, easy-to-read style. With eighty photographs, index, map of Native California, and listing of California Indian resources. Native Ways has been approved by the California Department of Education and is listed in the Instructional Materials Approved for Legal Compliance Catalog. 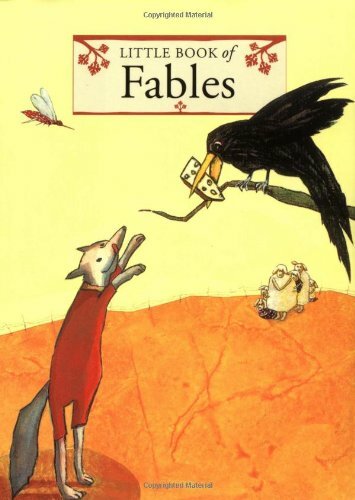 Uribe includes fascinating, comprehensive notes at the end of the book describing the life history of Aesop, the origin of fables and the other early fabulists, and fables as morality tales. 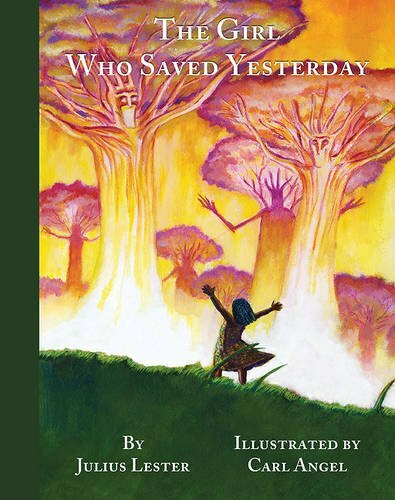 Beautifully retold and humorously illustrated, this collection of fables will entertain readers both young and old. The small format and elegant design of the book make it an ideal gift selection. What do Plato’s “concentric circles,” Ignatius Donnelly’s “mother culture,” and Edgar Cayce’s “firestones” all have in common? Does the center of gravity really lie at the earth’s core? What connection do the “warriors of the clouds” have to current civilization? 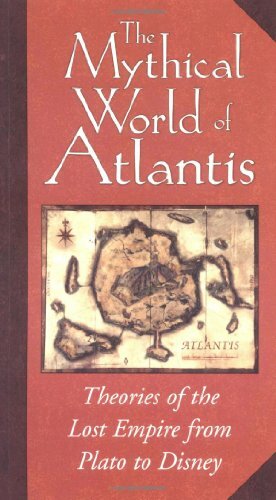 These and many other questions are answered in The Mythical World of Atlantis – a comprehensive study of the famed lost empire. Elements of theories about Atlantis put forth by philosophers and historians take their place alongside the “theory” revealed in Disney’s newest animated feature. An extension of the film’s fantasy, the book assumes that the fascinating lost civilization was real and flourished. Though the film’s mythology is wholly fabricated, the details conspire to provide the reader with a feeling of authenticity. 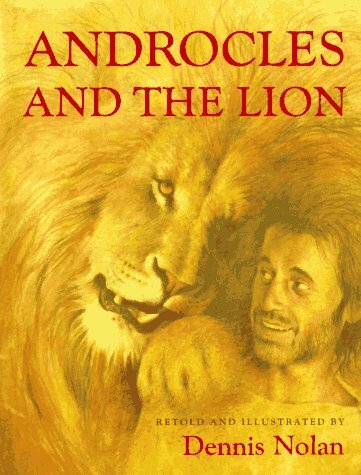 Androcles, a runaway slave, is befriended by a lion when he removes a huge thorn from its paw. For years the two live to-gether in the desert, until soldiers capture Androcles and are ordered to throw him to the beasts. Led into the grand arena, Androcles falls to his knees, accepting his fate, but then he looks into the eyes of the lion and recognizes his old friend. Amid cheers from the crowd, Androcles and the lion are set free. The earliest version of the well-known tale, Apion’s eyewitness account, is the source for this dramatic retelling. Why are cats and mice enemies? Are cats as smart as they seem? Here’s a story behind each of these feline traits. For centuries, people everywhere, from Tibet to Oman to Scotland to the United States, have been fascinated with cats and their intriguing personalities. 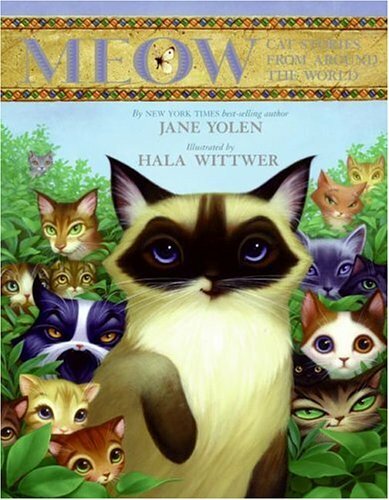 In this captivating collection, New York Times best-selling author Jane Yolen has gathered and adapted cat stories, sayings, and nursery rhymes from around the world. The glowing jewel-like illustrations of cats galore in their native homes have been lavishly painted by Hala Wittwer. The wonders found in fairy tales and myths have enriched childhoods for centuries. In between “Once upon a time” and “happily ever after” we embark on adventures that seem an eternity away from our everyday lives, and yet through these adventures we are brought back to the innocence and beauty of the truth. 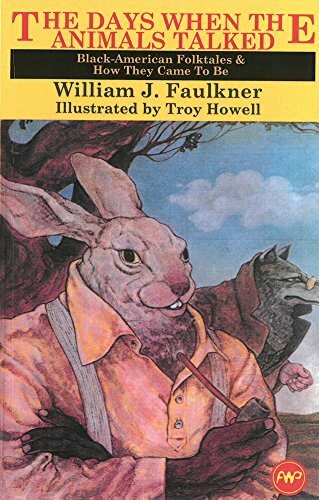 In The Mysteries of Children’s Literature, journey through a treasury of well-known fables and folk tales, as well as others not so well known, and discover the wisdom hiding within them. 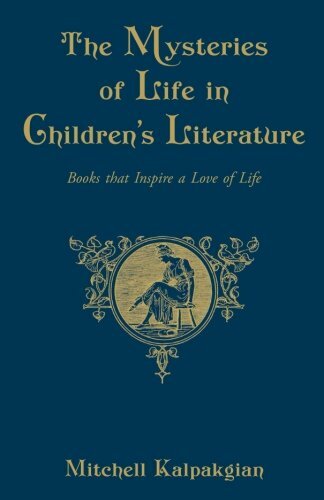 In an age that rejects the moral absolutes and repudiates the whole idea of intrinsic evils, children’s literature restores the meaning of good and evil, beautiful and ugly, and normal and abnormal. For centuries, the Great Stone Face has kept silent watch from Cannon Mountain, high above the Pemigewasset River. But who is the onlooker and for whom does he keep vigil? Though from warring tribes, Mohawk maiden Minerwa enchants Chief Pemigewasset, and with their union comes peace for many years. But when Minerwa leaves to visit her dying father, Pemigewasset must stay behind. 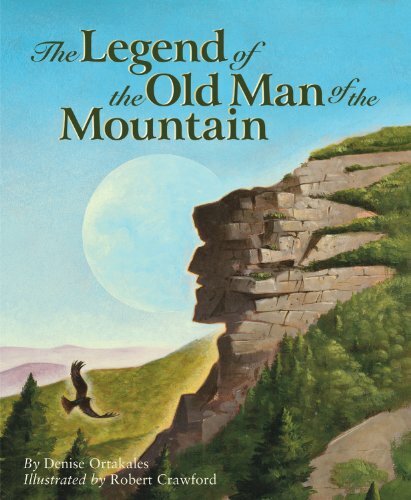 Denise Ortakales recounts the legend of Chief Pemigewasset, whose steadfast love and devotion to his wife is forever honored in his profile on the mountainside. Denise Ortakales graduated from the Art Institute of Boston, where she studied illustration and children’s literature. Having grown up in the shadow of the Old Man, it was natural for her to write about it as a school assignment. Years later, when the granite formation fell, she knew it was time to share that story with others. This is her first book as an author. 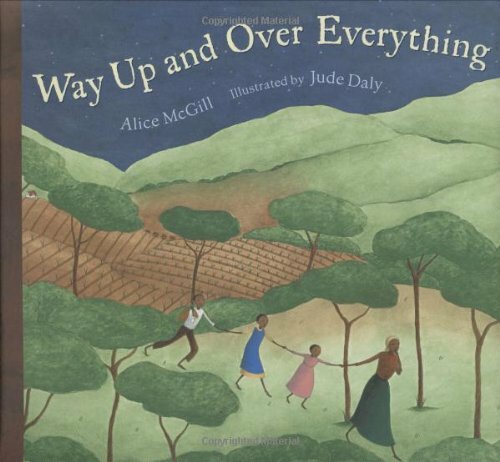 She has illustrated several picture books, including Carrot in My Pocket and Good Morning, Garden. Denise lives in Laconia, NH, with her husband and two sons. Artist Robert Crawford graduated from the Rhode Island School of Design. His paintings have appeared on the cover of major magazines such as Fortune, Business Week, The Atlantic and U.S. News and World Report, as well as book covers for major publishers including Random House, Penguin/Putnam, and Avon. Robert’s work has won numerous awards and has been selected for permanent collection by the United States government and major corporations. Robert lives in Woodbury, Connecticut. 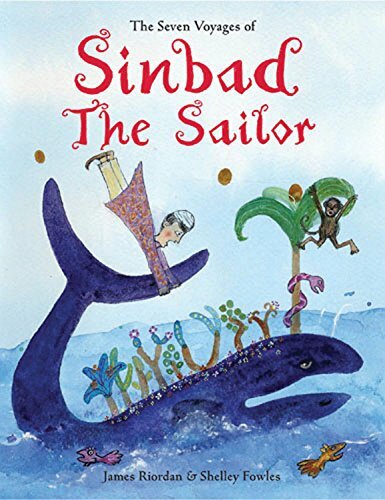 Sinbad’s adventures are the most fantastic of the stories in The Thousand and One Nights. During his twenty years as a merchant adventurer, Sinbad encounters a Rookh’s egg, a valley of diamonds, streams of amber, a terrifying sea-monster, an ogre’s feast, the Cave of the Dead, the Old Man of the Sea and much, much more… For this vibrant retelling, James Riordan has drawn particularly on Sir Richard Burton’s remarkable translation. Shelley Fowles tackles the illustrations with gusto and her comic touch gives these classic stories a highly contemporary feel. Spider wants to be a police captain! Can he capture the evil Blacksnake and show the town he’s a hero? Maybe he can stop Lion from stealing the other animals’ food—but if he’s not careful, he might wind up in Lion’s belly! 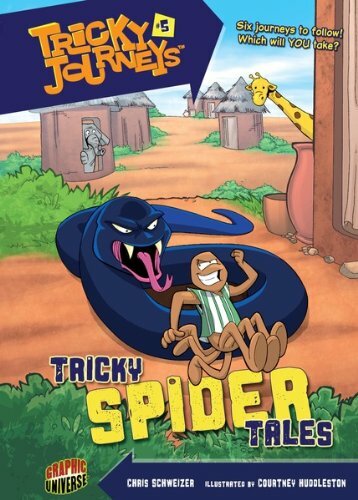 In these West African Spider tales, YOU decide what happens next! Six journeys to follow! Which will YOU take? Travel to ancient Cathay and meet young Aladdin as he engages in a battle of wits with an evil sorcerer. Enter an underground cave and come face-to-face with the Queen of the Serpents. Journey across a boundless desert to find the Lost City of Brass–and discover for yourself the horrible fate that befell its inhabitants. Many years ago, the stars twinkled in the desert sky as a beautiful woman entertained a sultan for one thousand and one nights with tales of demons and jinns, sultans and sailors, glittering jewels and lost lands. 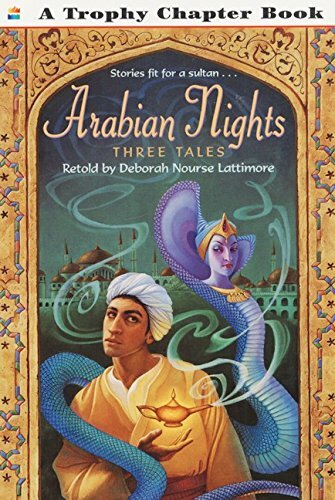 In this lively and accessible retelling, Deborah Nourse Lattimore brings to wondrous life all the adventure and magic of three of those special tales–tales so amazing, they can’t be true. From perilous Arctic journeys to strange giants in frozen snowfields, this collection of stories reveals fresh insights into universal themes, in language faithful to the oral tradition. 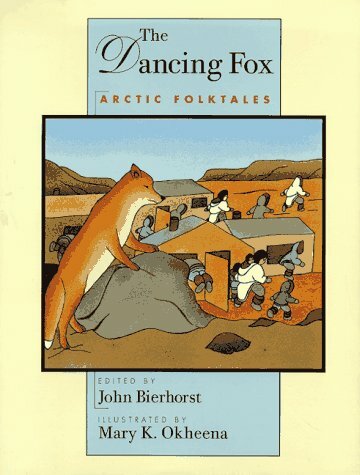 Illustrations by a contemporary Inuit artist round out this impeccably researched volume. In The Raven Queen, Maddy and her two cousins are preparing for battle. They are the only power preventing the devastating war unfolding in the faerie world from spilling over into the human realm. The trio is determined to protect everything and everyone they love from the dark Tuatha, the fierce faerie leaders. 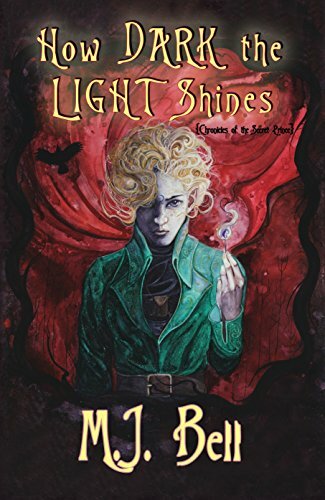 When Morrighan, the supreme ruler of the Tuatha, awakens, Maddy realizes she’s going to have to draw on her deepest reserves–and all her knowledge of the faeries and their ways–if she’s to outsmart the notoriously devious Tuatha. And should the Tuatha prevail, the two worlds will tumble into chaos, giving the faeries the upper hand. 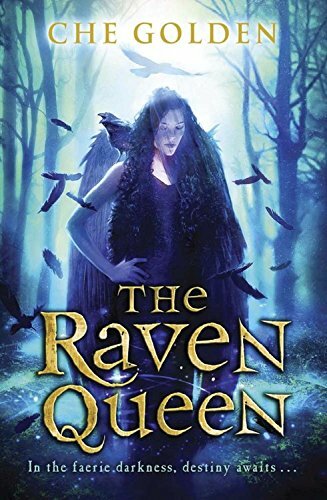 The Raven Queen is the thrilling conclusion of the Feral Child Trilogy, brimming with Irish folklore and faerie magic, and featuring a breathtaking showdown between the forces of good and evil. Welcome to the mesmerizing world of powerful gods, terrifying monsters, and courageous heroes! This action-packed guide to Ancient Greek mythology is filled with profiles of the most amazing characters, as well as brilliant images, fascinating facts, and riveting storytelling. Lavish CGI artworks recreate the most dramatic scenes from famous Greek myths, while incredible artifacts from the ancient Greek period are taken out from “behind the glass”. Young readers will feel as though they are being whisked back to Mount Olympus itself, while the artifacts offer historical context to the mythology. 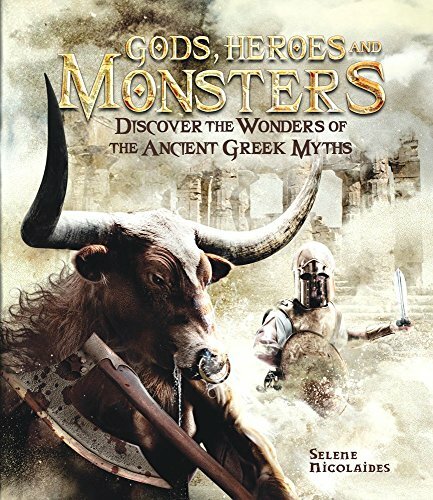 Gods, Heroes, and Monsters takes readers on a tour of discovery in which the legendary creatures, epic battles, and heroic deeds of Greek mythology come alive. It’s the perfect way to introduce (or rediscover) all the stories of the gods of Olympus, the Odyssey, the Trojan Wars, and the adventures of heroes such as Perseus and Heracles. From fates and furies to the Minotaur and Medusa, this book will stir every imagination. The third book of the Chronicles of the Secret Prince trilogy. Long before Deston was born, the gods chose him to be the match which drives the darkness from the planet. But he has no desire to be the hero. All he wants is to fit in and live happily-ever-after with his parents and Margaux. The problem with that dream is, it can’t happen as long as Grossard has the Shard of Erebus. For months Deston tries hiding out in the Great Bear Rainforest, denying who he is, but it eventually becomes obvious that no place is far enough away for him to escape his destiny. When the realization that his delays are only putting his loved ones in danger is finally forced upon him, he pushes aside his own wishes and accepts the mantle the gods laid out for him; for it’s going to take the human side of his nature to kill Grossard, and no other fae has that. It’s Deston’s last epic journey—the final showdown between light and dark, good and evil, and he knows the risks are high. But what he doesn’t know is that even if he wins, it could very well cost him the very thing he wants most in the world—to become a real fae. Rich in the folklore of his ancestors, Rudolfo Anaya’s tales will delight young readers from across the globe. In stories both original and passed down, this bestselling author incorporates powerful themes of family, faith, and choosing the right path in life. In “Lupe and la Llorona,” a 7th grader searches for the legendary Llorana; in “The Shepard Who Knew the Language of Animals,” a shepherd named Abel saves a snake and gains the ability to understand the language of animals; In “Dulcinea,” a 15-year-old dances with the Devil. Other tales feature coyotes, ravens, a woodcutter who tries to cheat death, the Virgin Mary, a golden carp, and a young Latino who seeks immortality. 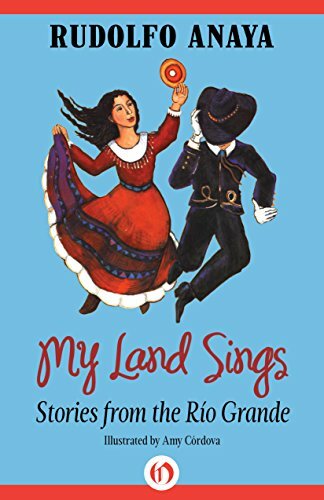 Deeply rooted in ancient mythological beliefs, these accounts of enchantment are as beautiful and mysterious as the Rio Grande itself—and serve as a testament to the lost art of oral storytelling. This ebook features illustrations by by Amy Córdova. Worshipped in some cultures, feared in others, loved as pets worldwide, cats are seen as possessing special power?athletic, supernatural, or intellectual. The nine tales included her show cats in all their glory. 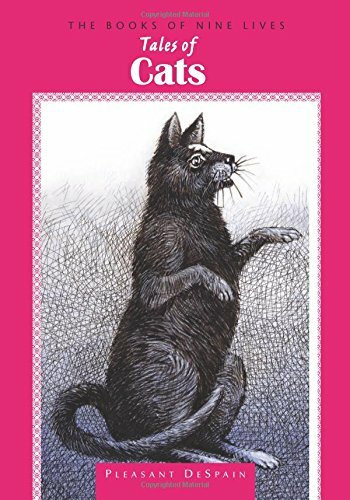 The cats in these stories are kind, cruel, independent, lovable?and always clever. These nine stories come from all points of the globe, including Sri Lanka (“The Magnificent Cat”), East Africa (“Why Cats Live with Women”), Italy (“The House of Cats”), and Tibet (“The Holy Cat”). 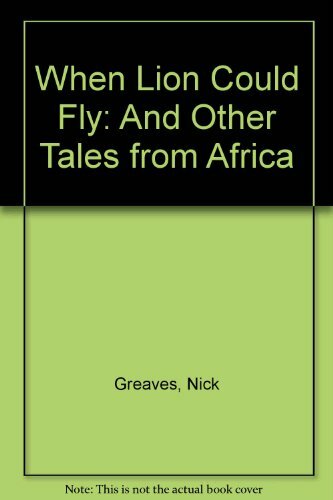 This unusual volume combines animal tales from African folklore with facts about the animals native either to Africa’s grasslands or its rainforests. Supplementing each tale is a table of facts about the story’s leading animal. A map of Africa shows where the animals live and migrate. An arrogant young girl who insults the bears must face the consequences: punishment from the bears themselves. 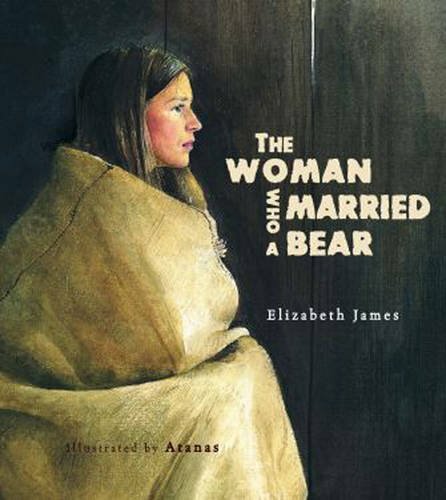 This retelling of an ancient West Coast First Nations’ tale about a young woman’s intimate encounter with the bears chronicles her transformative experiences. Detailed watercolor illustrations convey the spectacular natural beauty of the Pacific West Coast, from its misty seashores to its wildflower-filled meadows and icy mountain peaks. Both story and pictures teach children the importance of respecting and honoring nature and animals. Coyote is awfully hungry! Can he trick Bear into giving him his lunch? Or fool the prairie dogs into inviting him to their feast? But if Coyote’s not careful, HE could end up on the menu! 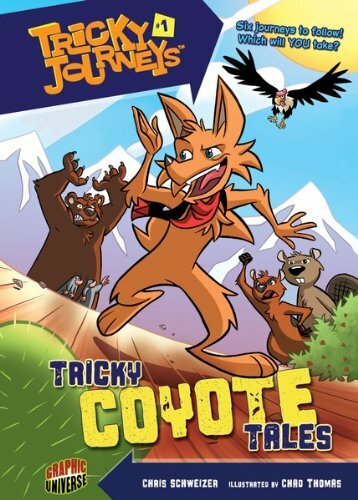 In these Native American Coyote tales, YOU decide what happens next! Six journeys to follow! Which will YOU take? Fox is enjoying a nice day at the marketplace, until her big cousin Roxy starts causing trouble. How can a little fox beat a giant bully? She’ll need to plan the perfect prank! 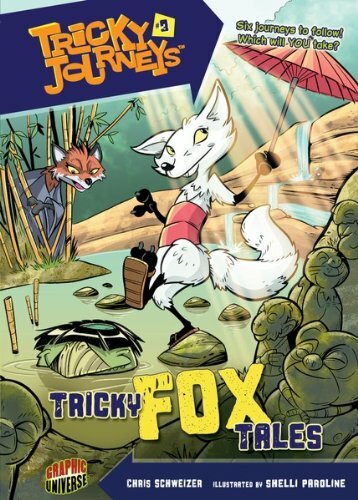 In these Japanese Fox tales, YOU get to decide who the trickster tricks next! Six journeys to follow! Which will YOU take? Arthur Geisert’s bold and handsome designs make each fable a work of art. Barbara Bader has faithfully retold these nineteen most important fables, complete with their concluding morals. 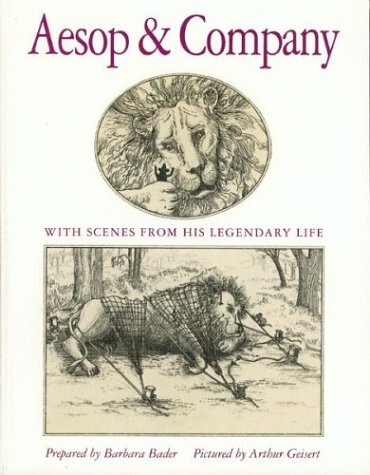 Bader has also included a scholarly introduction with sources and an epilogue about Aesop and the myth surrounding his life. The empty force is one of the most difficult and revered Chinese martial arts that utilizes the mysterious power of chi, a circulating life force energy. This text reveals the secret of this extraordinary technique and explains how it can be used in both healing and martial arts, where masters use its power to defeat opponents without making physical contact.